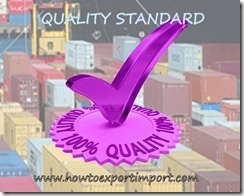 Import of some of the items needs quality standard approval of government agencies at importing country. 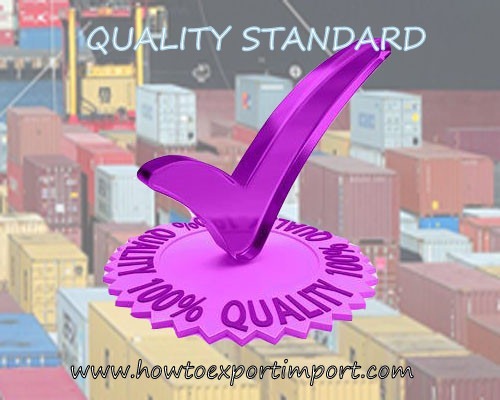 Importation of such items is subject to their compliance with said quality certificate from the quality approval authorities of importing country. Main objectives of quality standardization are harmonious development of standardization, marking and quality certification to provide new thrust to standardization and quality control to evolve a national strategy for according recognition to standards and integrating them with growth and development of production. Quality standardization brings technological, economic and societal benefits. They help to harmonize technical specifications of products and services making industry more efficient and breaking down barriers to international trade. Conformity to international standards helps reassure consumers that products are safe, efficient and good for the environment. Quality standardization is strategic tools and guidelines to help companies tackle some of the most demanding challenges of modern business. The benefits due to quality standardization are cost savings, enhanced customer satisfaction access to new markets, increased market share. Environmental benefits certification can be a useful tool to add credibility, by demonstrating that product or service meets the expectations of customers. Nitin Shah : On 18 February 2015 I am Nitin Shah from Mumbai, I am new in import business I would like to import aluminium scrap metals 99.9% Purity from Canada, can you please tell me which licence & Rcmc I have require for this. Seller ask me for the payment term (TT) Method of payment is 30% before packing of your goods for the following purposes and objectives (so that we can use it for the transportation of the OUR PRODUCT from our factory to the port of loading ,buying of packing tools, pay for the SGS testing fee, Insurance and Freight cost, shipping documents and the rest 70% when the goods arrive your port over there then you will confirm the quality of the goods before proceeding with the final business transaction, and this and we have being using these measures for several years now to make sure that we have a wonderful business transaction with all our customers for everlasting trust and completion. PROCEDURES AND COMMENTS 1. Buyer sent LOI and BCL. 1. Buyer sent LOI and BCL. 2. Seller sent the FCO. 3.Buyer signs, seals and return the FCO, with full banking coordinate and permission for Soft probe of found. 4.The seller verifies the financial capability, and then sent the draft contract. 5. Buyer signs the draft contract and sends it back to the Seller 6. Seller posts Performance invoice for payment 7. Buyer's bank issue payment with respect to amount on proforma invoice and contract form 8. Seller signs the final contract and returns it to buyer. 9. Shipment begins. Is there any option to find out party is genuine or fraud ?